Before I tell the story of one of history’s most often overlooked detectives, it’s important that you know something about a fictional detective character. Charlie Chan was a creation of novelist Earl Derr Biggers. Chan, a Honolulu police detective, first appeared in Biggers 1925 novel, The House Without a Key. The character was made famous in dozens of movies, comic book stories, radio shows and at least four television series stretching from the mid 1920’s until the late 1970’s. 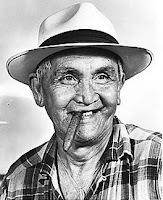 Chang Apana was the real-life detective in Honolulu whose career inspired Biggers to create the fictional character. Biggers met him while vacationing in Hawaii in 1919. Apana was born in China, but lived most of his life in Honolulu. His was a storied career as an aggressive and colorful police officer. The only Chinese member of the force; he was assigned to work in Honolulu’s Chinatown, also known as “Blood Town” and “Hells Half-Acre”. Much of his career was spent working opium smuggling and gambling crimes. There were many stories of his heroics and dangerous encounters. He carried a facial scar from having once been attacked by a leper with a sickle. On another occasion he was reported to have been thrown from a second story building, landing unharmed on his feet and furthering his mythical stature. He was also run over by a horse and buggy while pursuing a suspect. Apana carried a bull whip and, at least for part of his career, used it as his weapon of choice. He was credited with having arrested 40 suspects on gambling charges one night, armed only with his bull whip. 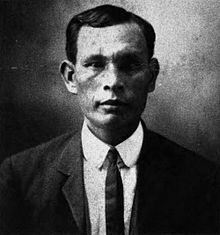 Chang Apana served with the Honolulu Police Department for 34 years and died in 1932. He died less than two years after retirement and is buried in the Manoa Chinese cemetery in Honolulu. Wow What a guy. One-third Batman, one-third Superman, one-third Lash Larue. Apana sounds like an over-achiever. I think maybe today's police forces should consider the bullwhip idea. I mean rounding up 40 suspects in one night with just a bullwhip, might be a skill worth emulating. And, not a lot of time is needed to reload.